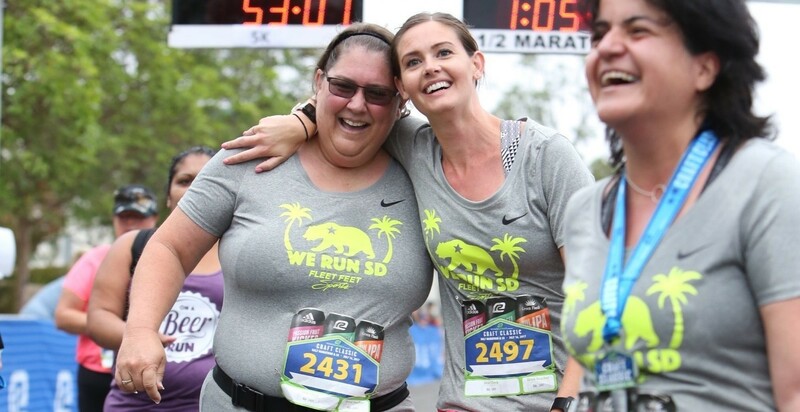 If you come to Fleet Feet San Diego on a Wednesday night or around one of our training group runs on Tuesday night or Saturday morning, you will see Glori Mcstravick (far left, finishing a race in the photo). She's become a store regular, always bringing tremendous positive energy with her through the doors. Glori is typically the first to arrive for workouts, and she stays after to talk about everything from running specifics to life in general. She has been an incredible addition to our store family, and we owe it all to a Facebook like from one of her coworkers. Many of us have been there. Sitting on the couch thinking how we want to start exercising. We want to begin a healthy workout program. We recognize that we do not have what it takes to do it on our own. We have gone out and tried to run a mile and that didn’t work. Last September, this was me. Then one day I mention this to my coworker, Verity Prey, who runs marathons at the drop of a hat. She wrote up a program and I decided, "I am going to do everything that Verity tells me to do and I will be running my half marathon by March." Sounds great doesn’t it? It was great until I bailed on Verity around November and went back to my old ways. Then one day while reading my Facebook feed, I see a program that Verity had “liked.” This was the Fleet Feet San Diego 10K Training Program Informational Meeting to on January 21. I decided that I would go to the meeting. Attending that meeting has been one of the best decisions for me and my health. I went to my first training and prior to the workout, I misread the workout plan and thought we were going to run for a very long time. Little did I know that Brent would have a great program for beginning runners like myself. The first workout took longer to walk to the park where we were running than the actual run. This was awesome. I felt so successful. This was the beginning of the next six months of friendships, workouts, and fun. I have added these workouts to my life. I run three days a week. I run slow, but I run. Every run has some sort of adventure, from having a little old man walk past me when I am running, to running/walking the Encinitas Half Marathon. I was even featured in the July issue of Women’s Running magazine. I got to try out really cool clothes and be in a photo shoot for an article about sports bras and clothing bottoms for all body types. I look forward to the days that I head over to the store, meet people and go running. I have a goal to run a 5K in less than 40 minutes someday. I may not run fast, but as one of my newfound friends has said: "I run, therefore I am a runner." I like being a runner.